Join Charly Caldwell, President of Internet Services Group of Florida, as he discusses changes in technology and how to capitalize on the changes to generate business. 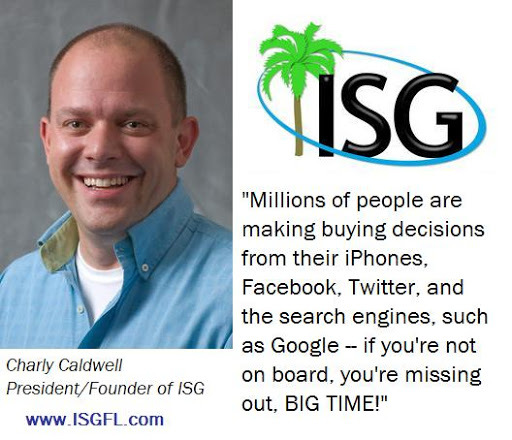 “Millions of people are making buying decisions from their iPhones, Facebook, Twitter, and the search engines, such as Google,” says Charlie, “if you’re not on board, you’re missing out, BIG TIME! As many are finding, traditional media, such as the phone book, newspaper ads, flyers, and even TV and radio are generating less activity than they used to. Statistics show more and more people are using the web to find answers and contact companies”.